As Government Ignores Court Order, Kenya's Media Blackout Continues : Parallels The government shut off three news stations to prevent coverage of the opposition leader declaring himself president. Press freedom advocates worry it represents a slide toward authoritarianism. 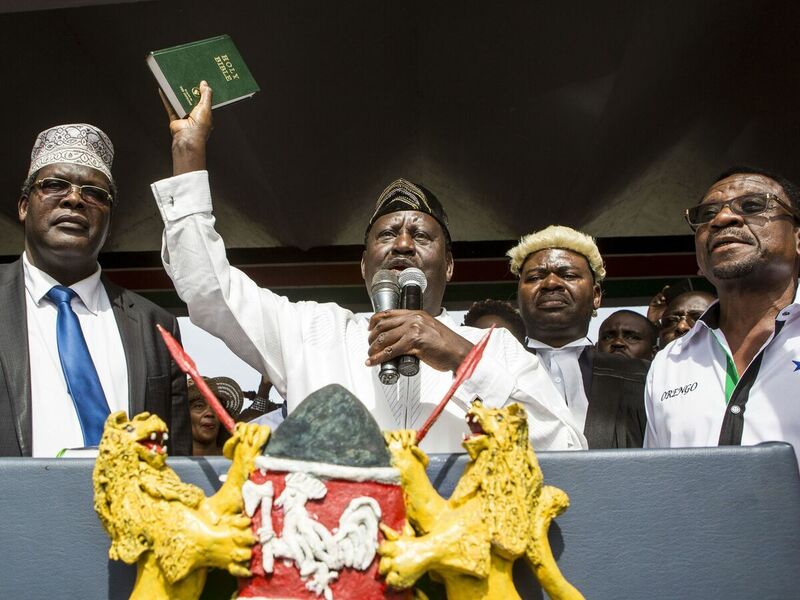 Kenya's opposition leader Raila Odinga holds up a Bible as he swears himself in as the "people's president" on Tuesday in Nairobi. Authorities shut the top three independent TV channels ahead of the event. They remain closed. When Okiya Omtatah arrived at the Communications Authority of Kenya Friday morning, he was met by a man in a suit. He stopped the civil rights activist and lawyer before he could get past the front gate. Kenya is once again in the middle of political turmoil. On Tuesday, opposition leader Raila Odinga, flanked by tens of thousands of supporters, defied government threats and declared himself president. Few in Kenya actually watched the legally insignificant ceremony. Before it happened, security forces surrounded a transmission station north of the capital and shut down the country's top three independent news stations. Prominent journalists at one of those stations spent a night holed up in a newsroom, fearing arrest. Now, four days later, the stations remain dark and the crackdown has raised doubts about a country that's been a stalwart of democracy on the continent. When Omtatah showed up at the Communications Authority building, he was carrying a two-page order issued by the High Court of Kenya on Thursday. It was unequivocal in asking the government to immediately restore news broadcasts and not to interfere with any transmissions until the court is able to decide on the constitutionality of the blackout. The man in the suit, Omtatah says, identified himself as a police officer and said he would not let Omtatah serve the order on the Communications Authority. In frustration, Omtatah just tacked the order on an exterior fence and went back to court to see what he could do. "I just think that we lowered our guard a bit," he said. "We got excited when we got the constitution and thought the chips would fall in place. But the constitution is only as good as the implementers. So I think we are going back to the trenches to protect the little gains we have made." The media crackdown has taken Kenya and the world by surprise. The East African powerhouse ushered in a new constitution in 2010 that is considered one of the most progressive in Africa. It solidified many of the democratic reforms the country made since the authoritarian regime of Daniel Arap Moi ended in 2002. It guarantees freedom of speech, assembly and the press. "Kenya has really been one of the beacons on the continent for media freedom," says Angela Quintal, the Africa program coordinator for the Committee to Protect Journalists. "So when you see this and you see other actions by the government, you see a deterioration of that space and it's eroding Kenya's status as a leader on African press freedom." The change is also surprising because it comes after Kenya's young constitution survived some shattering events. In September, for the first time in any African nation, a Supreme Court nullified the electoral victory of a sitting president. President Uhuru Kenyatta accepted the historic judgement, which also cemented the court's place as a co-equal branch of government, as the constitution had envisioned. Later that fall, as a second election got closer, the government banned demonstrations in all major cities. The High Court declared that was a clear infringement on the rights of Kenyans, and the government withdrew the ban. Kenyatta was re-elected. But on Tuesday, the government seemed to take a very different stand. It turned off TV signals before Odinga's mock inauguration even took place. The only two news stations that remained on air — the state broadcaster, KBC, and the presidentially owned news channel K24 — didn't broadcast the event. That same day, the government declared an arm of the opposition an "organized criminal group" and the day after, Fred Matiang'i, the cabinet secretary for the interior, gave an angry speech that described the event as nothing short of a coup. He accused the media of being complicit. Coverage of the opposition leader's symbolic oath taking, Matiang'i assured the public, would have led to a bloodbath. So the stations would remain off, he said, until the government completed an investigation. Then he issued a warning. "The individuals who are involved in this and the organizations involved in this, wherever they are within the borders of this country, will feel it," he said. "And they will be so sorry." Since then, the government has ignored a High Court order to turn the stations back on. State House, the president's official residence, only allowed KBC and K24 to cover President Kenyatta's return from the African Union Summit on Tuesday night. On Friday afternoon, Kenyatta seemed angry at the media. He finished a speech at the Kenya School of Government, but before anyone could ask a question, he told the media to "pack and get out." Omtatah, the lawyer and civil rights activist, could not get an extra push from the court. But he did publish the order in one of Kenya's major newspapers and he managed to serve the attorney general, the minister for interior and the minister for information. Omtatah says he expects the government to comply. He is a bit surprised they haven't yet. "These kinds of things help clarify the struggle," he said. "So that people now see that the real issue we're dealing with is impunity of those in government. And then it's a clarion call for us to get back in the trenches and continue agitating for total liberty."